There’s just something about unicorns, am I right? 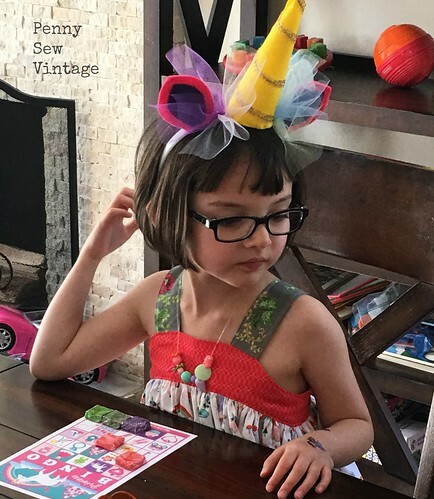 My girl is all about unicorns, rainbows, princesses and frog princes, so when I stumbled on Princess Dreams from Riley Blake, I snapped that fabric up before it sold out! 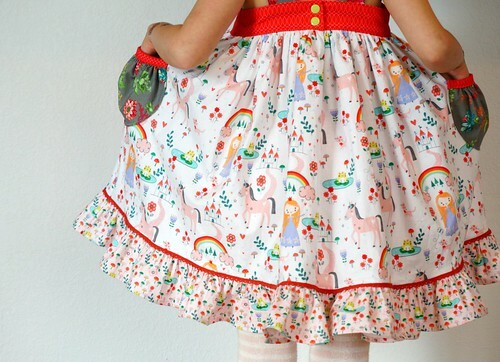 I knew she’d love it for her unicorn themed birthday party and it would make a cute party dress too. 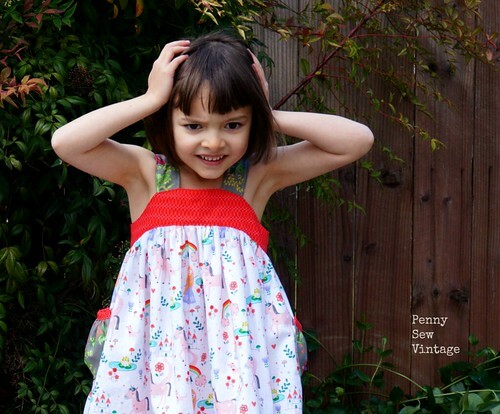 I used the Lemon Drop Dress* pattern from Tie Dye Diva because it’s so twirly and fun, and I really wanted to make a version with ruffles and big pockets. 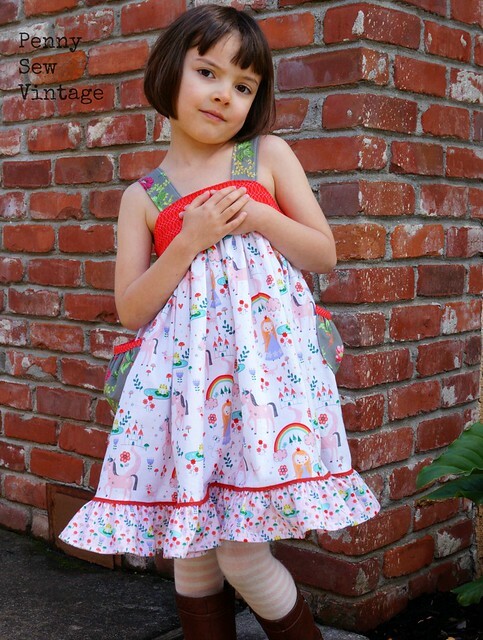 I put together a French seams tutorial too, which you can find on Tie Dye Diva’s blog, along with a special link to the Lemon Drop Dress pattern (her pattern site is in the middle of being updated). In case you’re wondering, the other two fabrics are Suzy Ultman’s Kokeshi Lattice for Robert Kaufman Fabrics (red bodice) and Anna Griffin’s Charlotte collection (gray pockets and straps). She fit into a size 3 bodice with a size 5 length. It’s really easy to combine sizes with this pattern. The instructions are very clear, and she includes a big stop sign for when it’s necessary to test fit before proceeding so you end up with a perfectly fitting bodice. The ruffles version is not for the timid though. I mean all those gathers! I’m not a fan of gathering in general, but in the end, it’s seriously amazing. 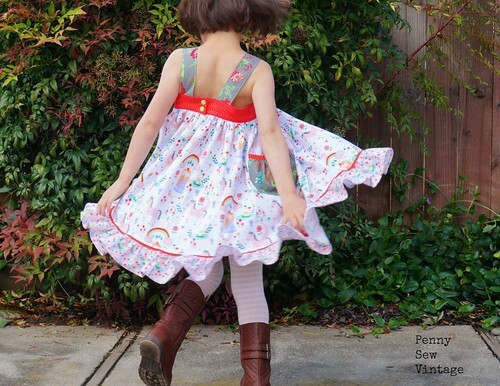 The fullness of the skirt and the twirl are definitely worth the gathers! My daughter loved it and felt special while wearing it and couldn’t stop twirling. She had to take a few twirling breaks to steady herself! The unicorn headbands were also a party must. 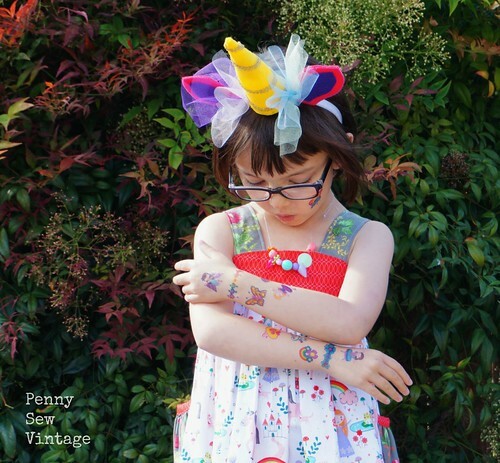 We sat down and scrolled through Pinterest (our inspiration board), and although the original theme really focused on fairytale princesses and frog princes, it quickly changed focus to unicorns and rainbows after she saw the unicorn party headbands! I followed this tutorial from The How-To Gal and added some tulle like Modern Moments Designs. Let me warn you though, you’ll be pulling out the big glue guns for this one! We also added a jewelry making station, Unicorn Snot body glitter, Piggy Paint rainbow nails, and many of these amazing Melissa and Doug temporary tattoos. These tattoos are great because none of them came out messed up. They ALL worked, even when my three year old started putting them all over her face in layers by herself. Yeah, they were all tatted up and sparkly before leaving my house. Parents love me. We played unicorn bingo too, which is such a fun way to keep things contained and kids from running around like nuts hyped up on sugar. I decided on these adorable Princess Bingo cards from Crazy Fox Paper on Etsy. I just didn’t have time to make them myself, and I love supporting crafters whenever possible! We were going to throw in a unicorn piñata, but it had to storm and rain the day of her party, so instead, my husband put together a little something called Candy Rain. Basically he put candy on top of our fan’s blades, then turned it on when the girls were underneath it. Candy starts falling slowly, but then seriously starts flying everywhere even on the slow speed. We had the girls wear sunglasses with rainbow frames that they could take home, because safety first, but it was totally worth hearing their squeals as they ran around for candy! Everyone had such a great time, and my birthday girl said it was the best birthday ever! We went to Disneyland last year, so I’ll take that as a huge success. Do you like throwing themed birthday parties? Do they outgrow themes at some point? I don’t know, but we sure had lots of fun planning this one!